Amazingly, plain old H2O can do most of the work removing burnt-on stains. Add a layer of water along with a cup of vinegar to the pan. Bring the water to a boil, then remove from heat and add two tablespoons of baking soda. Empty the pan and wipe debris with a non-abrasive scouring pad. 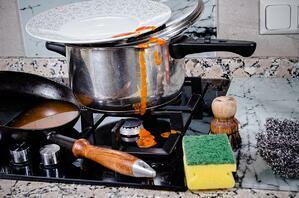 If you have enameled cookware, use a wooden spoon to remove the debris and prevent scratches. Out of baking soda? Alka-Seltzer provides enough fizz to make a good substitute. You may remember from high school chemistry class that oil and water don't mix. As a result, cooking oils can build up on pots and pans. Fill the greasy pot or pan with hot water and add a few squirts of Dawn or another grease-cutting dish detergent. Stir the water to generate some foam and let sit for an hour. Use a non-abrasive scouring pad to remove the grease and rinse with warm water. Even non-stick pans can develop a greasy film. Place the pan in the freezer for 30 minutes and simply scrape away the grease with a plastic utensil or scouring pad. Sprinkle Bar Keeper's Friend or a similar commercial cleaning product on the baking sheet and scrub with a balled-up piece of aluminum foil. Be careful not to use this method on a baking sheet with a special coating. Tea tree oil isn't just a multi-purpose health and beauty aid. Use a few drops of tea tree oil along with a few drops of dish detergent to remove a sticky film. Cast iron skillets are old-school, but they're still highly valued for their safety, durability and adaptability. The downside is that conventional washing techniques destroy the features that make cast iron such a good cooking material. Wash by hand using hot water and a stiff brush. Clean as soon as possible after use. Remove stubborn food particles with a paste of water and coarse kosher salt. Never allow a cast iron skillet to soak in water or run it through a dishwasher. Avoid dish detergent and steel wool. Dry the damp skillet thoroughly by placing it on a stove burner over low heat for about five minutes. Apply a thin layer of vegetable oil to the inside of the pan and buff away the excess before storing in a dry area. If the skillet develops a dull appearance, reseason with vegetable oil or shortening. Do you have a favorite cookware cleaning tip that we missed? Share it with us in the comments!